This isn’t a how-to, though I think these cookies are truly simple enough to create without one – I promise! 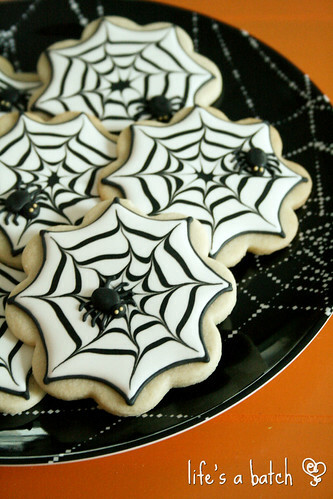 Spiderweb cookies aren’t new. They’re not even new to me, as I’ve done them a handful of times before. Truth be told, I don’t actually get to make very many Halloween cookies each year, as I’m usually buried in birthday cookies or other special occasions. As such, the spiderweb always makes me smile with it’s sweet simplicity. Previously, I’ve only made spiderwebs on circle-shaped cookies (rounds). There are a bunch of spiderweb cookie cutters out there (Karen’s Cookies, Coppergifts, The Cookie Cutter Shop), but I don’t actually have one myself. I didn’t feel like hand-cutting, so I browsed through my cookie cutter racks to see what else would work well. And I found the PERFECT cookie cutter: an 8-petal flower! I began by piping the outside edge, and it was easy to eyeball the center of the “petal” to create an 8-pointed spiderweb shape. The best part is that the smooth, rounded edges meant I didn’t have to worry about fragile points breaking off while handling or packaging the cookies, either. Win! And that’s it! 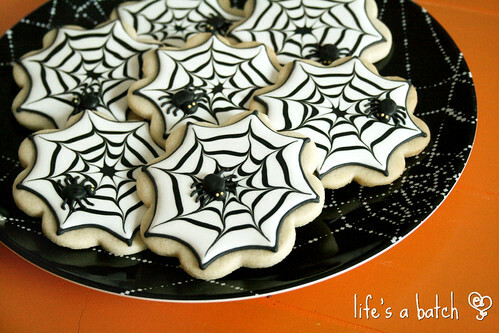 Sweet, simple spiderweb cookies that are sure to bring more smiles than screams. I love it! « May the 4th be with you, in cookies! 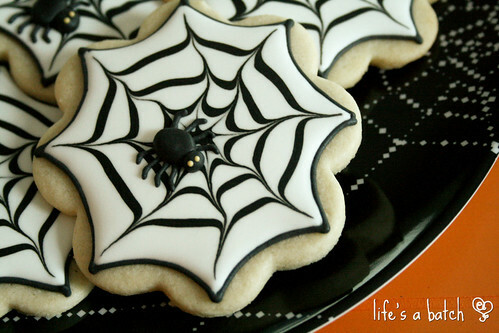 I think your idea of doing the spider webs on flower shaped cookies is simply brilliant! I’ve owned one of those pointed spider web cutters for a few years now, but I’ve never used it because I feel like the tips would brown too much in the oven or be to delicate like you said. You came up with the perfect solution! Love it, love it, love it!!!!! Thanks for sharing!!! Thanks, Jennifer! I’m glad you like it, and if you never use your spiderweb as intended, perhaps you’ll have a great idea for a shape to “bend” it into instead, ha! These are adorable!! Each one is just perfect. I’ll bet the kids loved them.